Dragon’s Domain Records, to be distributed through buysoundtrax.com, presents WATERMELON COOKIES, a compilation of film music composed by Zoë Poledouris-Roché. As the eldest daughter of film composer Basil Poledouris and his wife Bobbie, Zoë Poledouris took to music from an early age. As a child, she interpreted her father’s music as a competitive figure skater. At the age of nine, a piece of music she created while her dad was scoring CONAN THE BARBARIAN became the countermelody for a major sequence featured in the movie. WATERMELON COOKIES comprises Zoë’s selections of her film work from 1982 through 2013, encompassing a variety of styles from orchestral to grunge rock, delicate synth melodies to modern pop. WATERMELON COOKIES includes music from WHITE OF WINTER, CECIL B. DEMENTED, DOWN AND OUT WITH THE DOLLS, BULLY, TEENAGE CAVEMAN, BLIND/WHAT IF?, THE SAILOR’S GIRL, BIRDS and ALMOST. The album includes both instrumental works and songs, including a new piano-and-vocalise arrangement of her very first co-composition from CONAN THE BARBARIAN. By the time of her father’s passing at the age of 61 in November 2006, Zoë had scored six films and was establishing herself as a stimulating artist in her own right. With her husband, noted songwriter, musician, and percussionist Angel Roché Jr., Zoë writes and performs for their band Looner, and the two of them have become a formidable composing team for films, recently writing both songs and score for the animated family feature, THE HERO OF COLOR CITY (2014). Dragon’s Domain Records is excited to present WATERMELON COOKIES – THE FILM MUSIC OF ZÖE POLEDOURIS-ROCHÉ, containing music selections personally chosen by the composer, remastered by James Nelson at Digital Outland. The booklet includes exclusive liner notes written by author Randall Larson, with the participation of the composer herself. WATERMELON COOKIES – THE FILM MUSIC OF ZÖE POLEDOURIS-ROCHÉ is a limited edition release of 1000 units. 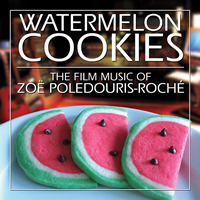 WATERMELON COOKIES – THE FILM MUSIC OF ZÖE POLEDOURIS-ROCHÉ will begin shipping on the week of Sept. 21st 2015. The First 100 copies will be autographed by Zoe Poledouris-Roche.